An app that monitors your heartbeat, another app that gauges your mood, and an app that monitors your calorie intake, warning you to skip that piece of chocolate cake – none of these may sound like a typical medical prescription. But one Vancouver doctor has been ‘prescribing’ these apps to his patients, almost the same way most doctors prescribe pills. As the director of the ehealth strategy office at the University of British Columbia, Dr. Kendall Ho has a lot of faith in mobile apps’ ability to engage patients in caring for their own health. Essentially, he’s encouraging them to embrace the quantified self, where they measure their own heart rate, blood glucose levels, or their level of fitness, he said. While on duty in the emergency department at the Vancouver General Hospital, Dr. Ho typically recommends apps to roughly one of every four patients who come to the emergency department – many of whom are young, and who are heavy smartphone users. “I suggest to the patient, well, just try some of these apps at first. It’s just like people, we need to be enculturated into certain ways of doing things,” Dr. Ho said, speaking from the Mobile Healthcare Summit held in downtown Toronto, a two-day conference for healthcare providers and IT professionals. (He added he doesn’t have any financial ties or interests in these apps). In picking out consumer medical apps for his patients, Dr. Ho has four pieces of criteria – they need to prove they’re useful, they have to be safe, and they need to be free (at least at the outset). They also need to protect users’ privacy to some extent, though he does warn patients these apps will often ask for their data. During the Mobile Healthcare Summit, he shared a slew of apps that he’s found useful – not just to his patients, but also in his own life. Last year, he began using Instant Heart Rate, an app that measures the user’s heartbeats when he or she sets a finger on the camera lens of a smartphone. Built by Azumio Inc., the app passed the 10 million download mark back in 2011. Dr. Ho began noticing his heartbeat was irregular at one point, but he wasn’t completely sure of it. So he fired up the app and confirmed it – and that led him to cut back on the coffee, he said. (Image: Azumio). 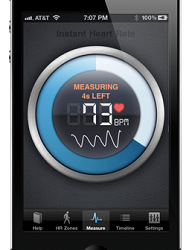 The Instant Heart Rate app. Then there was the time he used MyFitnessPal, an app that counts calorie intake. Users need only pick the foods they’re eating out of a database of more than 3 million entries, including multicultural dishes like shrimp dumplings. Two years ago, Dr. Ho managed to lose 13 pounds over an eight month period by using the app to track his own calorie and fat intake. (Image: MyFitnessPal). 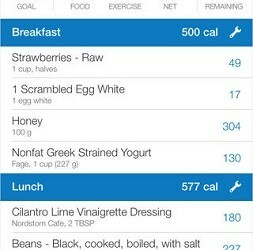 The Calorie Counter & Diet Tracker app. Then there are other apps that he’s recommended, like Mood Panda. For people suffering from anxiety, it can be really helpful, as it gets them to record their moods and the possible reasons that triggered them. There’s also an app called Sleep Time, which was also designed by Azumio and that helps people track their sleep cycles, waking them at the point when they’re in their lightest sleep cycle. Beyond free apps, there are also any number of commercial ones available – for example, Fitbit and Jawbone are two of the most well-known fitness trackers out there. Plus, the European Commission recently released its first edition of a book of health apps geared towards consumers, published in more than 30 languages with more than 60 specializations. (You can download the PDF here). However, as fun as using mobile apps may be, Dr. Ho said it’s important to remind patients that most of these apps – at least, the free ones – are consumer-grade only, and they don’t stack up against actual medical devices. Instead, the goal in using them is to get patients to screen themselves for symptoms a doctor may need to check out. And while consumer-facing, health-related apps are still relatively new, ultimately Dr. Ho said he hopes healthcare providers will actively help design them.